In Sumerian religion, Ninlil (𒀭𒊩𒌆𒆤 DNIN.LÍL"lady of the open field" or "Lady of the Wind"), also called Sud, in Assyrian called Mulliltu, is the consort goddess of Enlil. Her parentage is variously described. Most commonly she is called the daughter of Haia (god of stores) and Nunbarsegunu (or Ninshebargunnu (a goddess of barley) or Nisaba). Another Akkadian source says she is the daughter of Anu (a.k.a. An) and Antu (Sumerian Ki). Other sources call her a daughter of Anu and Nammu. She lived in Dilmun with her family. Impregnated by her husband Enlil, who lie with her by the water, she conceived a boy, Nanna/Suen, the future moon god. 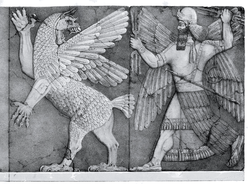 As punishment Enlil was dispatched to the underworld kingdom of Ereshkigal, where Ninlil joined him. Enlil impregnated her disguised as the gatekeeper, where upon she gave birth to their son Nergal, god of death. In a similar manner she conceived the underworld god Ninazu when Enlil impregnated her disguised as the man of the river of the nether world, a man-devouring river. Later Enlil disguised himself as the man of the boat, impregnating her with a fourth deity Enbilulu, god of rivers and canals. All of these act as substitutes for Nanna/Suen to ascend. In some texts Ninlil is also the mother of Ninurta, the heroic god who slew Asag the demon with his mace, Sharur. After her death, she became the goddess of the wind, like Enlil. She may be the Goddess of the South Wind referred to in the story of Adapa, as her husband Enlil was associated with northerly winter storms. As "Lady Wind" she may be associated with the figure of the Akkadian demon "Lil-itu", thought to have been the origin of the Hebrew Lilith legend. ^ "Enlil and Ninlil: translation". Faculty of Oriental Studies, University of Oxford. ^ "The Electronic Text Corpus of Sumerian Literature". Faculty of Oriental Studies, University of Oxford. This page was last edited on 20 March 2019, at 00:58 (UTC).